Biological control of parasitic flies means controlling them with natural organisms that are their natural enemies. Predators: they just eat the flies or their maggots: mainly birds, mites and beetles. Parasitoids: these are wasps that deposit their eggs on fly pupae. The larvae of the wasps feed on the tissues of the fly pupae that are ultimately killed. They can be considered as "parasites" of the flies. Pathogens: mainly bacteria, fungi and nematodes (roundworms) that infect and kill the adult flies or their larvae. They can be considered as "diseases" of the parasites. Many birds are very effective natural predators of flies, fly larvae, and many other insects, e.g. 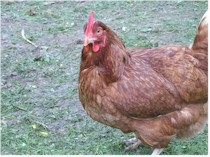 chicken, turkey, guinea fowls and many other domestic and wild birds. But most investigated birds are not predators of specific insect species. This means that they take potluck: they eat what is available. For these reason they cannot be used for the purpose of biological control of a given pest. A few mite species are voracious predators of eggs and larvae of houseflies and other filth flies that develop in manure and feces of livestock. They can be very useful in dairy, poultry and swine operations to keep the fly populations under control. Macrocheles muscaedomesticae is a tiny mite, about 1 mm long. It has a brownish color. It can eat up to 10 housefly eggs a day. It lives in manure heaps where it prefers the outer layers. It takes about 4 weeks for a Macrocheles population to become established on a manure heap. The mites disseminate attached to the body of various fly species. To achieve really efficient fly control with these mites they must be quite numerous, because a single fly deposits hundreds of eggs. Fuscuropoda vegetans is another mite species that prefers deeper layers in the manure heap. It feeds on young fly larvae and is a good complement to Macrocheles mites. Carcinops pumilio is a tiny beetle, 2 mm long and of a black color found worldwide that proliferates in manure heaps and dung piles. It feeds on both larvae and eggs of flies that breed in animal dung. It lives in the superficial layers of manure heaps and prefers dry manure. It takes 4 to 6 weeks for these beetles to colonize a manure heap. This must be considered when starting to accumulate manure. To make it easier for the beetles to find eggs and larvae manure must be kept as dry as possible by ensuring adequate aeration and avoiding water accumulation around the manure heaps. To colonize fresh manure heaps these beetles can be collected using black light pitfall traps. These beetles are attracted by blacklight, particularly during their migratory phase in spring. Such traps can be placed 30 to 50 cm over old (~25 weeks) manure heaps. Trapped beetles can be released over fresh manure heaps, or can be kept a 7 to 10°C for about 8 weeks, taking care of avoiding crowding, high humidity and too low or too high temperatures that would reduce survival. WARNING: Carcinops pumilo can transmit various poultry diseases. Consequently beetles collected in a poultry operation with sanitary problems should not be used to colonize manure heaps of other poultry operations. 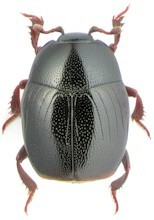 Gnathoncus nanus is another beetle found worldwide that also feeds on larvae and eggs on flies. Most chemical larvicides (mainly organophosphates and organophosphates) used to kill fly larvae in manure and other farm waste are broad-spectrum larvicides and therefore also toxic for beetles and other natural enemies of the flies. A notable exception is cyromazine, a narrow-spectrum larvicide. If such broad-spectrum larvicides are used, care must be taken to apply them when they are less harmful for the beneficial insects, which requires carefully monitoring their populations. Among the parasitoids of flies, most research has been conducted on hymenopteran wasps. These are very small wasps, 2-3 mm long that are found spontaneously in many livestock operations, but usually in low numbers. They are completely harmless for humans and livestock and quite specific parasites of flies. Female wasps lay usually one egg inside a fly pupa, and the developing larva feeds on the pupal tissues. About three weeks later an adult wasp emerges out of the pupa instead of an adult fly. Considerable progress has been achieved with these wasps and they are commercially produced and used with a reasonable success. The most useful species are those of the genus Muscidifurax against flies that breed in accumulated manure (e.g. houseflies, filth flies) and of the genus Spalangia against flies that breed on intact cowpats or hay (e.g. horn flies, face flies, stable flies). The levels of natural spontaneous parasitism (i.e. without human intervention) achieved by these wasps are usually rather low. This makes necessary to release hundreds or thousands of wasps reared in specialized laboratories. 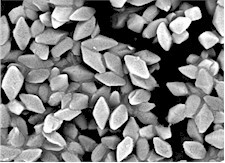 To this aim pupae of both wasp species Muscidifurax and Spalangia are commercially available in several countries. They are delivered in small boxes or bags that are released progressively in the facilities where the flies have to be controlled. To achieve the highest efficacy it is important to release the pupae when close to the peaks in the fly population. This requires carefully monitoring the fly population, e.g. counting specks in papers put up in the facilities, or using fly traps. If the wasp pupae are released too soon or too late, they won't find enough fly pupae to lay their eggs. Fly control using parasitoids can be quite successful in confined operations (piggeries, poultry houses, coops, dairy farms, etc.) and in feedlots, especially if it is combined with structural and hygienic meassures that reduce the number of potential breeding places of the flies. The reason is that it is possible to achieve a high density of fly wasps within a relatively small surface. Where fly resistance to classic pesticides is a problem, biological control can be more economic than chemical control. Biological control has also the advantage that it leaves no pesticide residues in milk, meat or eggs. So far, the use of hymenoptera wasps in extensive operations against horn flies and face flies has been disappointing. The main reason is that under such extensive field conditions it is not possible to reach a wasp density capable of significantly parasitizing the fly population. In addition, under open field conditions the wasps easily find other insects to deposit their eggs than those that need to be controlled. All pesticides with adulticidal effect (mainly organophosphates, carbamates, synthetic pyrethroids, phenylpyrazoles, neonicotinoids, etc) have a broad spectrum of activity and are toxic for these hymenopteran wasps as well, particularly if they are used to fumigate the facilities. Those pesticides for on-animal usage (pour-ons, insecticide-impregnated ear-tags, etc) are not likely to become in contact with the hymenopteran wasps and are possibly compatible with them, but little is known about it yet. Bacillus thuringiensis (Bt) is the best-known bacterial pathogen of insects. It produces thuringiensin, a protein that is lethal to many insects. There are numerous commercial products based on it, mainly for large-area mosquito control, but also for controlling other insects that develop in water, (e.g. black flies, midges, etc). They are also vastly used in crop protection. Such products contain basically Bt spores. If the flies or their larvae eat the spores or come otherwise in contact with them the bacteria will multiply in their organism and kill them within a few days. Its potential use against flies that breed on livestock dung (mainly against houseflies) has been intensively investigated. Unfortunately Bt is not appropriated for the control of fly larvae in the manure, because it also kills the beneficial insects that predate on fly larvae and eggs. And it is rather difficult to get the spores on adult flies. Even using traps or baits the number of flies that are reached is usually insufficient to significantly reduce the populations. In the last years another bacterial species has been identified (Brevibacillus laterosporus,) that seems to be harmless for fly predators and may have potential for being used in livestock oprataions against houseflies. Some lice species of cattle and poultry have been efficiently controlled with Bt, but mainly using formulations of thuringiensin, the toxin produced by Bt. There are several fungi that are pathogenic for flies and other insects that parasitize livestock. 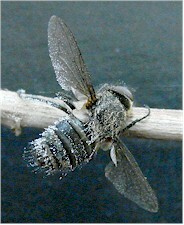 The best-investigated species are Entomophthora muscae, Beauveria bassiana and Metarhizium anisopliae. Once an insect comes in contact with spores of these pathogens the fungal mycelium spreads inside and outside the affected insect feeding on its tissues until it dies. Their efficacy of such fungi against several parasitic flies of livestock (e.g. horn flies, face flies, stable flies and houseflies) has been shown in numerous laboratory studies and small-scale field trials. When the spores of these fungi come in contact with the insects or other arthropods they stick to their cuticle, where they germinate and produce hyphae, thread-like filamentous structures. These hyphae diffrentiate into appressoria, structures capable of penetrating into the host's body, which they often do by piercing the membranes between the body or limb segments, or through the mouth pieces. Once inside the host's body they proliferate in its body fluid or hemocoel irreversibly damaging the body organs and ultimately killing the hosts within a few days. Some of these fungi produce also toxins. But as for pathogenic bacteria, treating manure with spores of these fungi is also lethal for the beneficial insects that colonize the manure heaps or cowpats. Promising results have been achieved using traps containing fungal spores and baited with fly attractants (mainly sexual pheromones). Trapped flies are inoculated with the spores, which kill them in a few days. Results are better in confined operations (poultry houses, piggeries, etc.) where the infected flies quickly transmit fungal spores to other flies. Several studies have shown that the features of the manure as well as the body temperature of the insects have a strong impact on the development of the fungi and on their pathogenic efffect on the flies. There are also several studies that have shown promising results of Metarhizium anisopliae against lice of cattle and poultry. Commercial products based on such fungal pathogens are already available in some countries, but mainly against crop protection of household pests. However, efficacy and usage under field conditions against flies and other insects that parasitize livestock is mostly insufficiently investigated so far. Numerous helminth species that are pathogenic for insects are already used in commercial products against crop pests. They are called entomopathogenic worms. The best-known genera are Steinermena and Heterorhabditis. These worms penetrate into the insect body where they release symbiotic bacteria that they carry inside. These bacteria multiply inside the insect, and kill it in a few days. The decaying tissues serve as nutrients for both worms and bacteria. Laboratory studies showed interesting efficacy against houseflies and other non-biting flies, either using traps containing baits inoculated with nematodes, or after direct treatment of manure with the nematodes. It is known that the type of soil and manure plays a decisive role in the efficacy, as well as the body temperature of the insects. Efficacy is highest between 22°C and 26°C and drops trongly below 18°C and over 30°C. However, confirmation of these results in large-scale field trials is still missing and there are so far no commercial products for fly control on livestock operations based on these entomopathogenic worms. In a few countries a product is available for the biological control of fleas outdoors using such entomopathogenic worms. It can significantly reduce flea populations in lawns, gardens, etc. However, it is not effective against adult fleas on pets and it is not suited for use indoors.